There are few things more exciting than introducing a debut author to the publishing world, and—lucky me!—that's exactly what I get to do today. Megan Morrison has been an EMLA client since early spring, and in fact, due to the twists and turns of bookworld timing, her good news has been waiting that long to be told. Well? Let us wait no longer! Today I'm overjoyed to spotlight Megan Morrison's astonishing new series—a fairy tale world come to life in a way so rich and all-encompassing that reading it quite took my breath away. First up in this Once upon a Tyme series is GROUNDED: A TALE OF RAPUNZEL. Weaving together elements and characters from the traditional fairy tales, Megan has crafted a story that is inventive and stunningly original, starting at the point where Rapunzel boldly follows a marauding prince out her tower and out into the world. What she discovers there, how she manages to survive, and where her journey takes her next is just the start of this page-turner that's as beautifully written as it is compelling. GROUNDED was sold to Cheryl Klein at Arthur A. Levine Books, in a two-book deal—which means that, yes, there are more Tyme books soon on the way. Stay tuned for summer 2015, when this amazing first book hits the shelves. YELLOW COPTER on the way! Publishing is a funny business. We get ideas about things having to be a certain way because that's how they usually are—but sometimes it seems as though there are more exceptions than rules. Take Kersten Hamilton's adorable young picture book, RED TRUCK. The hardcover came out in 2008. It got a starred review. Its Amazon page is full of parents saying how much their small children love its energetic text and onomotopoeia. It, pardon the pun, trucked right along, but didn't break any records. Last year (four years later! ), the publisher (Viking) released a board book version, and it really took off! Cut to the present day, and Kersten is signing up a companion book. Now, who would have thought a sequel/companion/series could be had five years after first publication? But there you go. A funny business indeed, and we are happy that RED TRUCK has found its groove and will now be the first of what we hope will be many. Like RED TRUCK, the new book, YELLOW COPTER, will be published by Viking and illustrated by Valieria Petrone. Unlike RED TRUCK, Kersten has a new agent AND a new editor, as the editor of RED TRUCK has moved on in the intervening years. So YELLOW COPTER was signed by the wonderful Kendra Levin, for world rights, and was represented by...well, me! Congratulations, Kersten, on creating such lively, fun, young-child-engaging texts (and on the new book deal)! Maria Gianferrari and her TERRIFIC TONGUES! Maria Gianferrari and I began working together almost exactly one year ago, in August of 2012. However, we had been corresponding for over two years before that, ever since we met at a PEN New England awards ceremony, where Maria's non-fiction manuscript received the Susan P. Bloom Discovery Award. The manuscript which won that prize, and which she read aloud that day, was TERRIFIC TONGUES, a colorful celebration of animal tongues and all the wild and multi-purpose ways they differ from our own. Fascinating stuff, to be sure! In the time since then Maria wrote a number of other projects—and in the last year, has sold the newly retitled PENNY AND JELLY picture books to Houghton Mifflin Harcourt, and the lyrical non-fiction picture book COYOTE MOON to Roaring Brook Press. But it's especially sweet when publishing comes full circle, and that's why I am thrilled with this sale I am announcing today. Can you guess? YES! I am overjoyed to share the news that TERRIFIC TONGUES has been acquired by the lovely Rebecca Davis of Boyds Mills Press! This is Maria's fourth book sale to date, and I'm sure it won't be the last. Long-Kept Deals Are Sweeter? Ask Pat Zietlow Miller! One couldn't accuse Pat Zietlow Miller of having a slow summer. Her debut picture book, SOPHIE'S SQUASH, is not on shelves until August and has already garnered four starred reviews. Two other books are under contract as well: SHARING THE BREAD (Schwartz & Wade, 2015), and THE QUICKEST KID IN CLARKSVILLE (Chronicle, 2015). But lurking amongst all this good news is... yes! You guessed it: Still MORE good news. And so today we have yet another deal to announce on Pat's behalf: A gorgeous, lyrical picture book text entitled WHEREVER YOU GO, a celebration of life and all the many roads we take to travel it. This amazing, sure-to-be-a-classic book was the center of much excitement a few months ago when it was acquired (at auction!) by Connie Hsu at Little Brown. Since then, it's been announced that the amazing NYT bestselling illustrator Eliza Wheeler will be the one to bring the words to life. We couldn't think of a better pairing, and can't wait to see what wonders this team cooks up. Congratulations to Pat and all! New Book Deal for K. A. Holt! Kari Anne Holt is the author of the middle-grade novels BRAINS FOR LUNCH and MIKE STELLAR: NERVES OF STEEL, as well as her more recent book deal, POETRY BANDIT, which will be coming out from Chronicle Books in Fall 2014. But as those of you who know her will attest, Kari is a BUSY lady: it may therefore come as no surprise to hear that I have come today to announce a deal for Kari's fourth novel! Following in the footsteps of her last book, HOUSE ARREST is a middle-grade novel in verse which tells the story of a boy whose baby brother is perilously ill. Choosing to take matters into his own hands leads our protagonist into all sorts of trouble, which he must now make reparations for over the course of one very tumultuous year. This is a moving, transformative novel which you won't want to miss. HOUSE ARREST was acquired again by Tamra Tuller at Chronicle, and will be hitting shelves in Fall 2015. Congratulations, Kari! I know I've said it before, but it always bears repeating: The debut deals are extra-sweet, especially when the author's journey has required extra doses of patience. I've been working with Christy Lenzi for five and a half years, and we've had many, many near misses for her amazingly lush and beautiful work, and she's built up quite a stable of editors who admire it--but of course what she's been working toward is an actual DEAL, and it's happening, it's really happening! Christy's newest YA manuscript hit the right chord with Katherine Jacobs at Roaring Brook Press, who is a perfect match for Christy (well worth waiting for)--and with the whole team at Macmillan--and so STONE FIELD, a lyrical retelling of WUTHERING HEIGHTS set during the American Civil War, will be a Roaring Brook Press book, most likely in fall 2015. It just goes to show, things work out how they were meant to work out! I predict a long and fruitful career ahead for dear Christy, who is a consummate craftsperson. I know she has a lot of supporters out there online, so let the huzzahs begin! Two More Books for Rebecca Van Slyke! If you're thinking to yourself that it's just been a week or so since we posted an announcement listing a two-book deal for Rebecca Van Slyke, you would be right. Yet here we are again... WITH ANOTHER ONE! In her charming picture books MOM SCHOOL and DAD SCHOOL, Rebecca Van Slyke imagines the kind of superior training parents must have had to receive to turn them into the bed-tucking, back-scratching, owie-fixing experts they are today. These winning texts are sly and silly and packed with heart, and are sure to be loved by kids and parents alike. Today I'm delighted to announce that these two books will be published by Frances Gilbert at Doubleday. Huge congratulations to Rebecca! If Mylisa Larsen were a kangaroo, she'd be hopping higher than the average marsupial--her first picture book deal just happened a week and a half ago, and here's another, just announced! IF I WERE A KANGAROO is an inventive goodnight poem that explores how different animals sleep (from "fin to fin" like whales, to "legs, legs, legs next to each other" like spiders), and it was just signed by Tracy Gates at Viking Children's. Tracy is an absolutely stellar picture book editor, and she's expressed her happiness at having Mylisa on her list--and I'm thrilled to pieces to have a book on her list at last, too! We can't to see what Tracy and art director Denise Cronin come up with illustrator-wise--it should be a fun journey indeed. Ah July. Fireworks and bbqs and lazy summer days. But not for the ghosts! Rules for Ghosting by A.J. Paquette, published by Walker Children's, follows Dahlia (a ghost) and her human friend, Oliver, who must solve a decades-long mystery in order to ensure a happy ending. Ghost in the House by Ammi-Joan Paquette, published by Candlewick, is about a ghost who discovers there are are scarier monsters than even he realized living in the house with him. 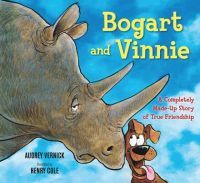 Starred Review for Bogart & Vinnie! The heart wants what the hearts wants. Case in point: Vinnie, a "crazy-happy" dog (and seldom has a description been more apt) who wanders into a nature preserve for exotic animals and decides that his new best friend is Bogart, a hulking, solitude-loving rhino. "Nobody knew what attracted Vinnie to Bogart," Vernick (Brothers at Bat) muses. "Was it his color? His shape? His horn? His other horn? The way he completely ignored Vinnie?" Athough Bogart looks like he'd rather be anywhere than at Vinnie's side, this unlikely combo of perpetually panting irrepressibleness and weltschmerz—a yin and yang of expressiveness that Cole (Nelly May Has Her Say) illustrates with panache—becomes a global sensation and forms "the kind of family where one member loves the other and one wants nothing more than to be left alone. But still, a family." It's a witty, bighearted story that makes full use of this duo's comic talents while poking gentle fun at the human tendency to coo over interspecies friendships (and then turn them into children's books). A Fourth Star Triumph for DARK TRIUMPH! In this sequel to Grave Mercy (Houghton Harcourt, 2012), Sybella leaves the convent where she has learned her assassin's skills and returns to Brittany, where she must endure her father's unspeakable cruelty and the incestuous love of her half brother. Determined to undermine D'Albret at every turn and stay loyal to Duchess Anne, she carries out covert operations and looks for opportunities to use her skills and bring evildoers to justice. She helps to foil a plot to capture Anne and frees the Beast of Waroch, the duchess's most loyal and fierce champion, from D'Albret's prison, all the while waiting for an opening to kill her father. When the knight knocks her out and takes her along with him, her cover is blown and she despairs that no one will be able to stop D'Albret's reign of terror. As with the first book, LaFevers has filled the pages of her novel with adventure, and the pace is electrifyingly fast. The characters are well drawn, and even the secondary figures have dimension. Sybella's quick-thinking and fearless approach to terrifying personal and political situations renders her an incredibly strong protagonist with whom readers will identify. The love that develops between her and Beast provides a model of a healthy relationship built on mutual trust and understanding. Realistic details of 15th-century Breton life abound, providing an overall clear and accurate picture of the times. There is much talk about St. Mortain as the Lord of Death, which some may find disturbing, but these topics are handled well and the story will leave readers eager for the series' finale. Melanie Crowder Harnesses the Power of the Fourth! Yes, it is the eve of July fourth, and perhaps we're being a little liberal with the puns here. But honestly, it was just too good to pass up. What is that, you ask? Simply this: On this very celebratory Fourth of July, we are here to celebrate with you Melanie Crowder's fourth book deal! Melanie's debut middle-grade novel, PARCHED, was released early last month from Houghton Mifflin Harcourt, to many accolades and glowing reviews. Several weeks ago, she signed a deal for two YA books, to be published by Philomel. Today, we closed the deal for Melanie's second middle-grade novel, which will be published once again by the lovely Reka Simonsen at Houghton. The new book is still untitled and is in top-secret stages of early development, but it will involve a girl, a moody marshland, a restless water spirit, and a debt long overdue. If that's piqued your interest, you are not alone! Keep a lookout for this lush and amazing book up ahead.